Last Edit: 2 months 6 days ago by Mac. 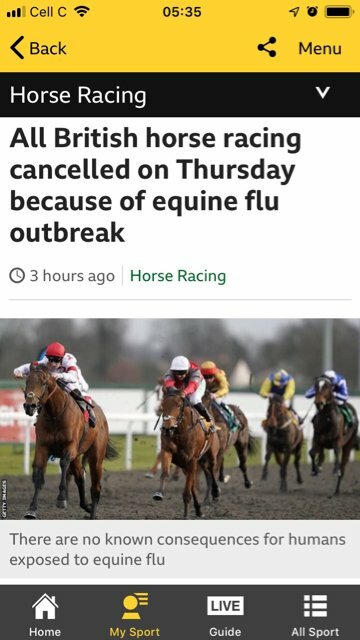 All meetings in Britain scheduled for Thursday have been cancelled following three confirmed cases of equine influenza, all from vaccinated horses in an active racing yard. Meetings at Huntingdon, Doncaster, Ffos Las and Chelmsford will not go ahead after the BHA announced the emergency measure in a statement released late on Wednesday evening. The statement read: "The BHA, with unanimous support of the industry veterinary committee, has taken the decision to cancel racing at all British racecourses on Thursday 7 February 2019. "This is following the BHA being informed this evening by the Animal Health Trust of three confirmed Equine Influenza positives from vaccinated horses in an active racing yard. "Horses from the infected yard have raced today at Ayr and Ludlow, potentially exposing a significant number of horses from yards across the country and in Ireland. The fact that the cases have been identified in vaccinated horses presents a cause for significant concern over welfare and the potential spread of the disease and the action to cancel racing has been viewed as necessary in order to restrict, as far as possible, the risk of further spread of the disease." Cases of equine influenza had been reported in recent weeks, originally in France but spreading to Ireland and Britain. The BHA issued a warning to racing professionals on January 19 but, until now, no cases in Britain had been confirmed from active yards in vaccinated horses. The statement continues: "The BHA has worked quickly to identify which yards could have potentially been exposed today and identify the further actions required. The BHA is presently communicating with yards potentially exposed to ensure appropriate quarantine and biosecurity measures are put in place and horse movements restricted to avoid possible further spread of the disease. "The full extent of potential exposure is unknown and we are working quickly to understand as much as we can to assist our decision making. The BHA is working closely with the Animal Health Trust and will issue a further update tomorrow. We recommend that any trainer who has concerns about the health status of any of their horses should contact their veterinarian." Equine influenza is an airborne infection and can travel over fairly large distances and even be transferred through humans, so the prospect of it spreading can be high. Outbreaks are rare, but one such incident in Australia in 2007 brought racing to a halt nationwide on August 25 and, while the Melbourne spring carnival took place under strict bio-security measures, racing in Sydney did not resume until December 1 of that year. Still better than Flamingo Park, Durban poly, PE poly & Scottsville. Is that the 'purist' racing you are referring to? Get used to it - SA racing is plummeting downhill. Phum shares declined to R10 this morning. Last Edit: 2 months 2 weeks ago by Garrick. If the horses that ran from the affected yard yesterday test negative for equine flu today, then racing is likely to resume very quickly, but if one of them tests positive, then we could be in for a long stoppage. Last Edit: 2 months 2 weeks ago by Steckenpferd. 33 days to Cheltenham and if this goes on for two or three weeks i doubt very much if the owners of those top class Irish horses will risk bringing them over to Britain. Last Edit: 2 months 2 weeks ago by chicken n chips. ......of course not.....but count your lucky stars it did not happen in peak racing season when an epidemic like this can/could wreak more damage to all those functions jobs and people we/you feel sorry for....but it is always the smaller end of the food chain , the battlers that cannot compete in season that will get the hardship at this point in time.....there may be respite in that this may be contained due to colder weather ....however it seems to be a viral strain that is not addressed by current inoculations as some horses affected have had flu shots.... .
that will be very bad although i think that at least 60% of the horses that will be running in Dubai are there already. No UK racing this weekend for sure and maybe most of next week at least as there are 6 stables who are now on lock down already with others still to be checked out.